Prepped in five minutes, cooked in less than 10, this is a super-quick supper dish that still packs loads of flavour. No marinating, no waiting. Just instant (well, nearly) gratification and a light and spicy antidote to Christmas. Serving suggestions: we had it with peas and baby potatoes because that’s what I had handy at the end of a long day’s work, but anything from wilted greens or a crisp green salad to lemon rice would work just as well. Make a quick and simple sauce by mixing creme fraiche with grated lime and lemon zest, a tablespoon of chopped coriander or parsley and a pinch of salt. 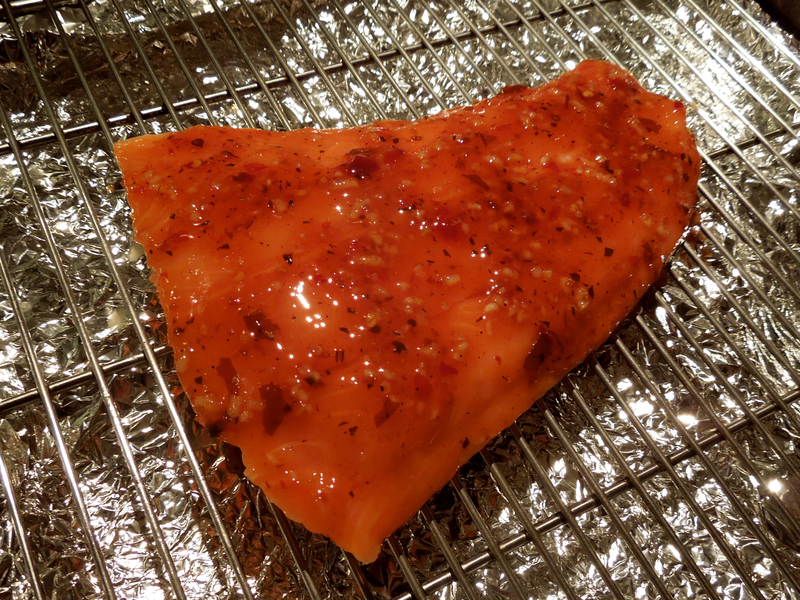 Heat the grill to high and line the grill pan with foil. Mix the chilli sauce and hot sauce and stir in the crushed garlic. Brush liberally onto the salmon steaks. 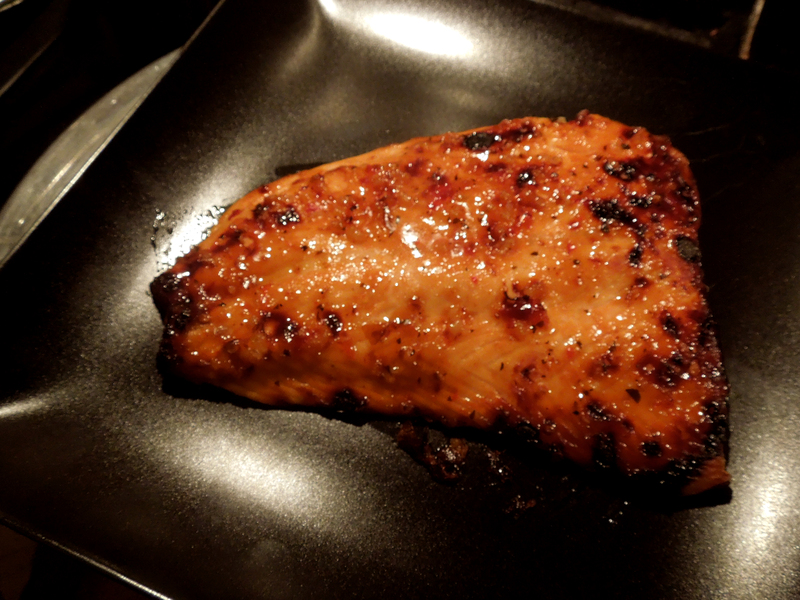 Put the fish under the hot grill and cook for around eight minutes, depending on the thickness of the steaks, until the fish is cooked but juicy and the glaze is nicely burnished. 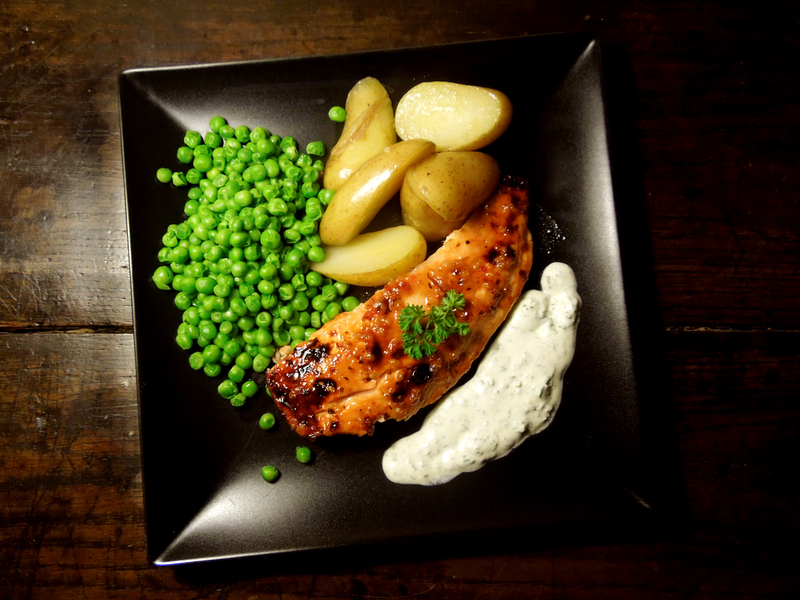 This entry was posted in Fish and shellfish and tagged grilled salmon with a chilli glaze, low-fat recipes, quick suppers by Linda Duffin. Bookmark the permalink. I like it! 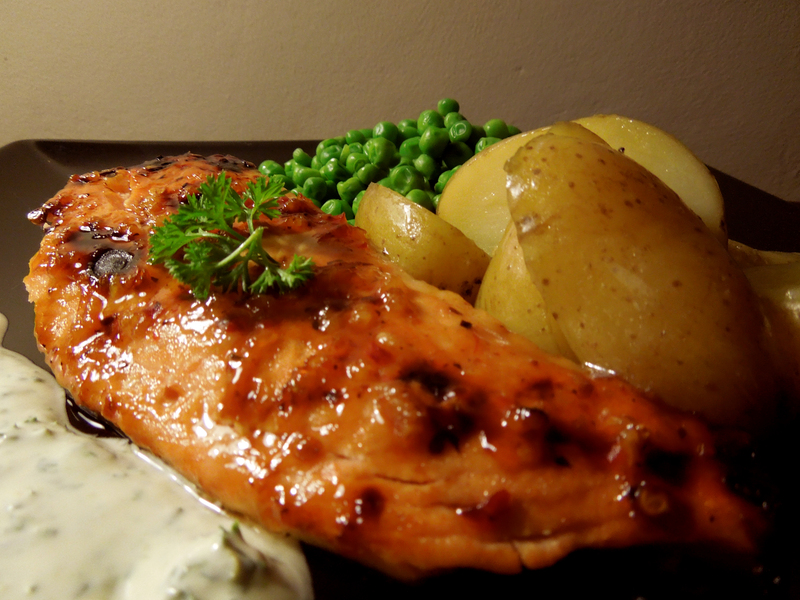 We eat salmon once a week and it has become pretty boring (don’t rat me out!). I might suggest this, without showing the Wife this page as it now has this comment. Hi Linda, I’ve been following your blog for a while and feel like it’s high time for me to tell you how much I enjoy reading your posts. Sweet and simple with some delicious looking food. Cheers. Hi Eva, lovely to hear from you, many thanks. I’m glad you like the blog and the recipes. It’s good to hear nice things from fellow cooks! And do please keep the comments coming. I love swapping ideas ….